If this nasty virus of 2 weeks would go away... Monday would be the start of a lovely week. I'm hopeful. ... The colours add nicely to the column. Have a good week Ginnie. Ginnie Hart: Ohhhhh. So sorry about the nasties for you at this time of the year, Jacquelyn. Get well soon! Ginnie Hart: Oh, yes, Elaine. You've shown me your lamp. Stained glass is so beautiful, especially when the Sun hits it just right! Ginnie Hart: My camera was in heaven that day, Ray. Now, maybe my manipulation tools leave something to be desired??? Ginnie Hart: The joys of sun-playing, Peter. We are so lucky to see it happen. Those prisms are so beautiful! Great find! So beautiful and mystical Ginnie! Ginnie Hart: That's how I feel about prisms, too, Richard. Thank you. Ginnie Hart: You know me well, dear Lisl. Sometimes it finds me, when I'm least expecting it, which is part of the wonder of it all. Ginnie Hart: Thank you, Chris. On many occasions Astrid and I have been in a church at just the right time for the special effects. We are always in awe when it happens! Jolis détails de cette colonne. I remember that wonderful light that the stained glass gave. Love your point of focus. Beautiful shot, wonderful memory. Ginnie Hart: We were so lucky that moment in time, MLMA. It happens often, now that I think about it. Thank you. Oh, an excellent treatment to show this capital. I'm looking forward to tomorrow, too. Yesterday Tecklenburg was overcrowded, the closed huts will be still there tomorrow, for next weekend an Adventsmarket will be taking place. Ginnie Hart: Thank you, Philine. Tomorrow we will have some "peace and quiet" compared to the crowded weekend. It'll be wonderful. Yes, you have been there at just the right moment - I think it should be! Ginnie Hart: Yes, and thank you, Philine. Nice stained glass reflection Ginnie. 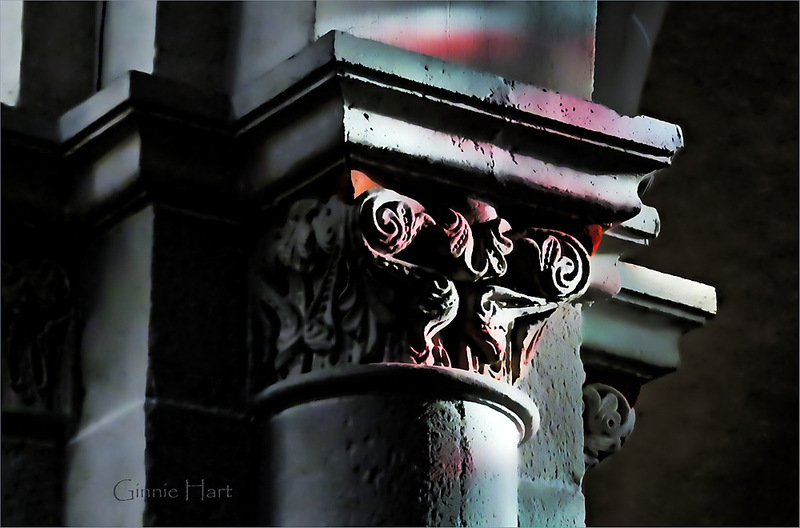 A smooth engaged column with Corinthian capital. Very nice Ginnie. Ginnie Hart: Smooth operator, Chad. Thank you. With prisms comes change. Yep. Monday. Ginnie Hart: And let's hope change is good, Mary. It usually is. Ginnie Hart: The right moment at the right time, Pat. Thank you. Ginnie Hart: We have often had these lucky moments in churches, Janet, and will never forget them. Thank you. I like the lighting very much; the prisms have done a good job. Ginnie Hart: Thank you kindly, Alan. Prisms like this are magical. Terrific image Ginnie, so fortunate to be there for that lighting. Ginnie Hart: Thanks, Brian. This is when one feels "blessed." Ginnie Hart: Thanks, Ayush. It surprises me how many times Astrid and I just happen to be there at the right moment! The colours really add some beauty to the already beautiful stone. Ginnie Hart: That's what I thought, too, Michael. Thank you. Simply beautiful! Love stained-glass prisms! Ginnie Hart: I do, too, Robin, and I'm surprised how many times we get to see them in churches we visit!